SJPBC Greenkeepers Win Top Award…….Again! Our green keeping team have again been honoured for their design and maintenance of the club’s gardens and grounds, taking our first place for a commercial garden in the annual City of Fairfield Spring Garden Competition for the fourth time. Head Greenkeeper Peter Thompson said he was delighted that the green keeping had won this awards again. “We love what we do but it is always a special moment for our expertise to be recognised by the judges and the City of Fairfield” he said. “The club has a number of garden zones from the main entrance to the courtyard barbecue areas and around the greens. We have to make sure that plantings are suited to the different areas and that they look their best all year round. The gardening team uses natives, companion planting and colour that changes with the seasons. “We focus on water-wise and cost effective planting”, Peter Thompson explains, “we use lots of hardy natives to withstand the hot conditions, and a good layer of mulch to conserve the moisture in the soil”. Water usage is a major issue for the club as water is essential for the greens and gardens. 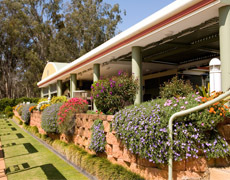 The club has used recycled water for over 10 years having installed three 80, 000 litre tanks. These tanks capture rainwater from the Alfresco Terrace and part of the club roof and the greens also have a drainage system that recycles excess water back to the storage tanks. The City of Fairfield Spring Garden Competition is organised and judges by the City of Fairfield Garden Club and sponsored by the City of Fairfield Council. Members can be assured that the club is fully aware of the need to be a good corporate citizen and to reduce the impact of the business on the environment as much as possible. Many steps have already been taken to save energy, reduce waste and recycle water. To conserve electricity all the club’s lighting is controlled through a system called Dynalite. The internal lights and external lights in the car park and on the greens are programmed to turn off when the club is not open and when there is no staff at work. We are also able to reduce the percentage of the wattage used on any light on this system (e.g. a 60 watt globe can be programmed to run at 80%) and currently this is the case with many of the club’s internal lights. Serious droughts have made people more aware of water usage and this is a major issue for the club as water is essential to keep the greens in tip-top condition. Members will be pleased to know that the club has used recycled water for over 10 years as we have three 80,000 litre tanks. These tanks capture rainwater from the Alfresco Terrace and part of the club roof and the greens also have a drainage system that recycles excess water back to the storage tanks. In addition we have worked closely with Fairfield City Council to make the club a greener organisation. Such initiatives include the introduction of a waterless wok to the kitchen, saving 5-6kl per day. We also pulp all green waste from the kitchen. This not only reduces land fill, it is then used at a treatment plant to be turned into electricity and fed back into the grid. In administration the club is moving to have paperless Board meetings with each director equipped with a laptop and most board papers now delivered electronically, cutting down significantly on paper usage. Large organisations such as the club are big users of energy and resources. However, we try to balance the need to provide excellent services to our members and a safe work environment for our staff with the responsibility of reducing our impact on the environment.